To governing bodies and institutions, my first name is "Ramon", but I'm one of those people who has lived life by middle name. 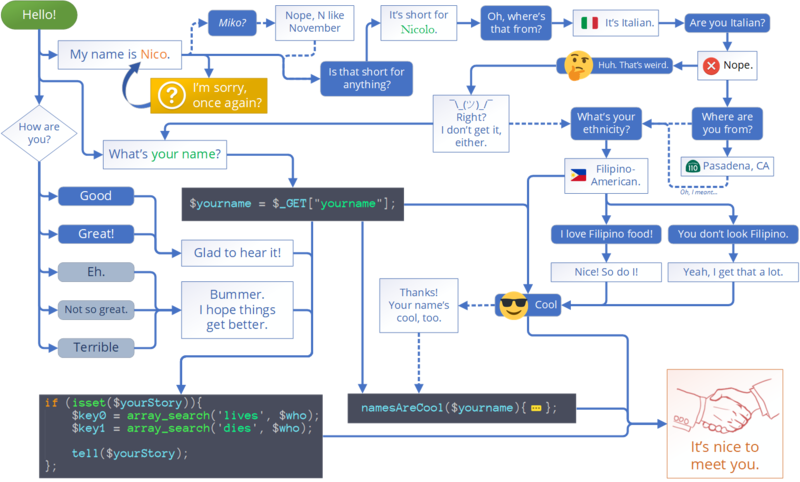 My name is Nico del Castillo, a surprisingly not uncommon name, and I am a web developer of mostly the frontend variety. I live in Los Angeles, CA. I work on the internet. What kind of stuff on the internet? You're looking at it! I make websites. This site was made with Grav because I like the idea of a flat-file CMS, but a lot of my frontend work has been in PHP, most often with WordPress. This website is intended to be a portfolio, but that has long been an ongoing process of reconstructing and unbranding projects to be more easily distributable. While that goes on behind the curtain, the remainder of my work tends to be solving specific roadblock problems within an existing project. Anecdotally, many developers I've met do not like doing this -- reverse engineering someone else's unfamiliar code can be disorienting and frustrating. I am not afraid of being frustrated. I am addicted to the feeling of overcoming it. Does your website need to be fixed? These things happen. Need a hand? Consider emailng me at nico@nicodelcastillo.com. The views, opinions, positions or ideas expressed by me ("Nico del Castillo" and/or "nicopolitan") are mine alone, and do not necessarily reflect the views, opinions, positions or beliefs of my respective clients, employers, or employees. I, Nico del Castillo, make no representations as to accuracy, completeness, currentness, suitability, or validity of any information and will not be liable for any errors, omissions, or delays in this information or any losses, injuries, or damages arising from its display or use. I, as Nico del Castillo or as "nicopolitan", reserve the right to delete, edit, or alter in any manner I see fit posts on these networks that I, in my sole discretion, deem to be unduly offensive, defamatory, threatening, in violation of trademark, copyright or other laws, or is otherwise unacceptable. I am trusting your good will on this one. If I have determined that the thing you've tweeted at me threatens me, I will react in the interest of self-preservation. But otherwise, any "thing" goes, even thoughts and opinions I greatly despise. I politely ask you to be civil. I encourage silly. But I have no control over you, only me. © 2019 Nico del Castillo. All rights reserved. All trademarks are property of their respective owners.